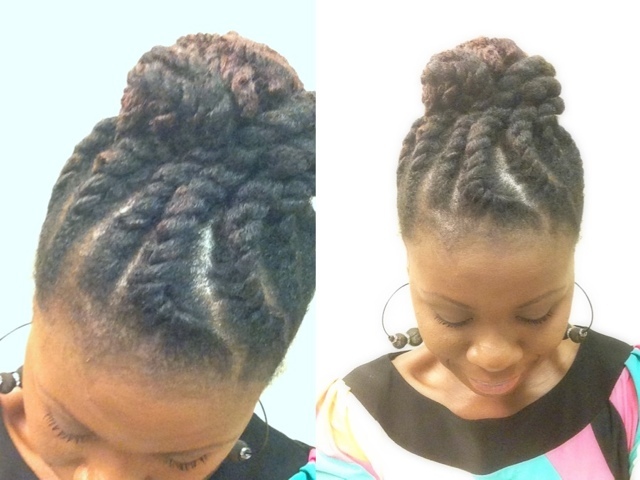 So if you have noticed, I have been protective-styling for the past four months or so. This is my fourth install. I don't want to sound like a broken record but my hair is fine and breaks less when it is not being manipulated. This was sort of a quick style. It took me about two hours as I was working really slow. I made the flat twists very big. I have about 14 of them altogether. I used less than one pack of Marley hair in 1B/33. 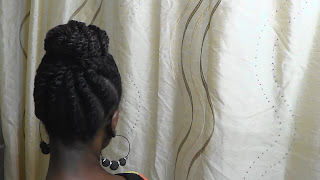 I made them big as this is my first time using Marley hair to install Flat twists Once I get better with flat-twisting with Marley hair, I would do them smaller. 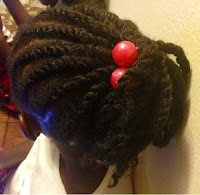 My little one actually have the same style and more flat twists. But I did not take good pictures when they were newly installed. It was not easy flat twisting the back of my head. I was very stressed out..LOL. But I kept trying and took my time. 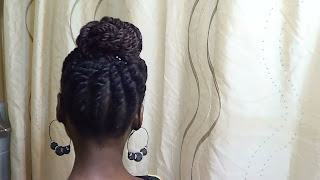 I found out that you have to bend forward at the waist to cornrow or flat twist your hair up..... not easy, trust me. 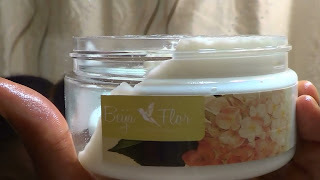 My hair was clarified with Bentonite Clay, conditioned in two parts, first with a combination of Henna, coconut oil and Hibiscus and then with Shea Moisture Anti-Breakage Mask. Then I applied Shea Moisture Conditioner for Fine and Thin hair as a leave-in. I sealed the moisture in with coconut oil. I did a little tension blow-drying to stretch my hair, since I was styling it right away. Before I installed each Flat Twists, I applied Beija Flor's Creme Brulee to each section. 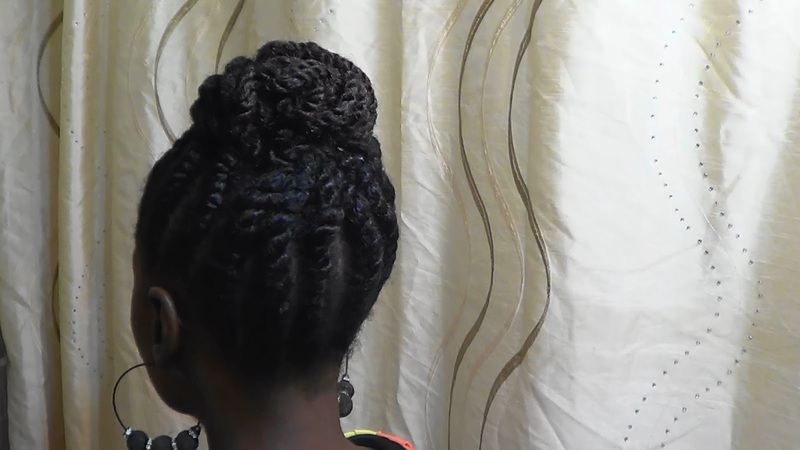 For the actual technique used to add Marley hair to the Flat twists, stay tuned for the video tutorial. I promise to have the video ready by September 7th. Like I stated in my last post, I only wash my hair once a month, when it is out of protective styles. My scalp, while I am wearing protective styles, including this one, is cleansed a few times a week, with diluted ACV and Tea tree oil. I do this a few times a week because I exercise a few times a week. 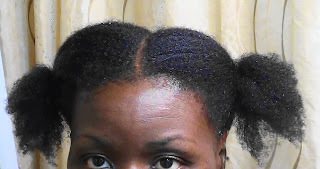 Since these are flat twists, I will not be washing my hair the traditional way. However, I will be cleaning the spaces between the flat twists with a Q-tip,that has been dipped in the solution mentioned above. 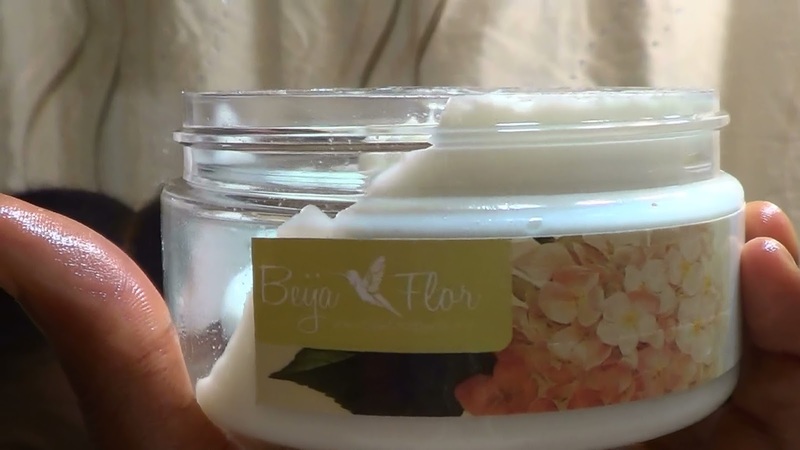 I also will be moisturizing with Aloe Vera juice, mixed with a little bit of Shea Moisture conditioner for fine and thin hair, tea tree oil and coconut oil. This will be done only twice a week. Night time Routine: I simply tie down my hair with a scarf. The satin bonnet does not work for this style. To keep frizzes away from the flat twists, the Flat twists have to be tied down. I plan on keeping this style for two weeks. I don't expect this style to last for more than two weeks due to the size of the twists and how loose they were installed. Yes... it s so versatile for different occasions. Thanks! Yes, yes, yes . . . I love the up do. It looks so mice. Thank you o.Braiding upward is no joke. You have to completely change your posture. Thanks Love. Practice makes perfect. Take your time. I always say that practice while you watch the video. Trust me it works. I love this style! You're right...Flat twisting the back of your hair is no joke! LOL. Thank you for the tip! Nice job on the back, sis. I can't tell you had problems at all. Are these going to stay in for a month also? Thank you!. No, This is coming out at the end of the second week. A pack of hair is about $5. I had to come back and look at this again. This style is so beautiful to my eyes. When my hair comes back . . . or while it is coming back, I might seriously try this. I do think it will look better, though, when my hair has fully returned. Good thing I am patient. In the meantime, Imma have to bookmark this page right here. Aww.. thanks. I am so behind on your blog especially since you made it private. Your hair looks lovely. 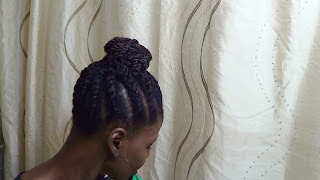 I have never braided or flat twisted upwards. I'm not sure how to follow your blog, I hope I did it right. I will do this style today.